I meant to start writing this post earlier so I could actually write something substantial for the first time in a while, but alas, it's midnight and exhaustion from work is quickly catching up with me. I stayed in for the first night in a while, and I had planned on using this time to plan out some blog posts. However, after skyping with a friend from college, I ended up using all of my free time to watch the newest Veep, look for plane tickets to visit my brother and friends in Illinois later this year, and looking for roommates. Unfortunately, my friend and potential roommate ended up finding a room to rent that she loved, so I'm back to square one. I'm finally ready to get an apartment now, so I started looking into some sites that I trust for a roommate since I don't have any other friends who I think I could live with or who are looking at the moment. So creative blogging has been put on hold once again. Remember when I used to write pop culture posts? Sigh. Those were the days. I wore this outfit last week to visit my parents with my boyfriend and best friend. We ate tacos and took the boat out on the lake. California life, am I right? It has since gotten surprisingly gloomy and chilly (for our standards), which I guess means that June Gloom is setting in early. I was just starting to break out the sandals, but I suppose I'm okay with pulling my cardigans and booties back out. Who am I kidding? My cardigans are always out. Can we talk Mad Men? I'm honestly just ready for it to end. I loved all of the badass feminist moments with Joan and Peggy last episode, but I could do without the Betty/Pete stuff from this past weekend. It's all just dragging out at this point. I love the denim and floral combo. Stunning! So cute! 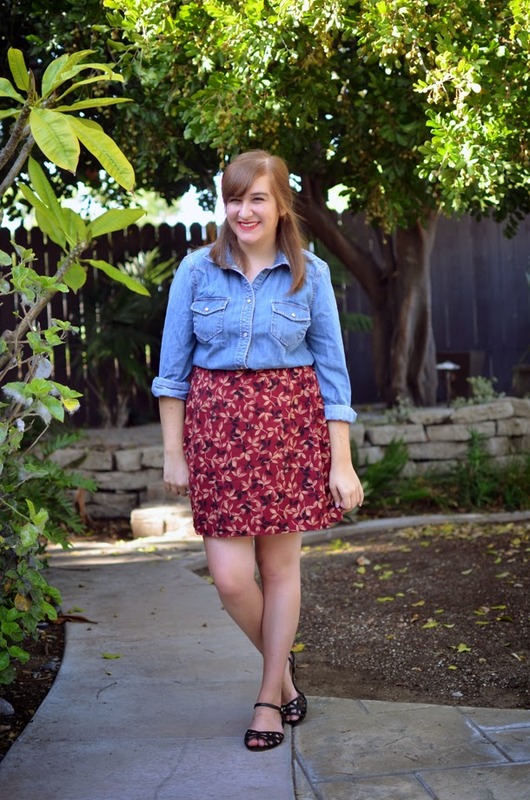 Sadly, my chambray top doesn't get as much love as it should! Love this: "Who am I kidding? My cardigans are always out." Mine too!!! I love this look from you. I don't know what it is, but this outfit makes me fall in love with chambray/denim shirts all over again. Good luck as you continue to apartment/roommate search.